Investigated this morning and it would seem that the relay that I’m convinced used to click over quite nicely is now no longer doing so (photo of it below and part number is Lucas 33285A). I can get the lights to turn on and all functioning properly with beem, dipped and also sidelights and indicators so I think the bonnet plug is ok. The fuse is a 35A fuse. I am just thinking that if the relay were to fail would that put too much current through the fuse, can’t seem to find a diagram or any reference to the relay that my car has. It does look original. My understanding is that there is no relay as standard for the headlights. It looks like you may have an ‘upgrade’ there, albeit from a long time ago judging by the terminal cover colouring. Also, there should be 3 fuses involved. High beam, Low beam and side & panel lights (F1, F2 & F5 respectively). Have you got one fuse that affects all of them, on the feed side? At a rough guess, this relay is meant to bypass the light switch contacts. But without being able to see where those wires go it is just a guess. That second top wire might be Brown/White, in which case it could be some sort of feed from the ammeter or the light switch. That pair of wires on the 3rd terminal (white) – do they go to the dip switch & Fuse No. 5? I’m not an expert, but I don’t think failing relays pop fuses. They tend to just stop working. Try removing the relay and connecting the W1 terminal to 12v positive. Then connect W2 to earth and see if it clicks. Oh the joys of wiring! I can confirm I do have that fuse setup, the only fuse affecting the feed is fuse 5 (the red wires and side/panel lights as you say). As far as I can tell this is the same feed that goes to W1 on the relay and should activate it because it does get 12v, but I am not hearing the click of the relay. The pair of wires on 3 goes to the HRS. I now think this relay is the one used for the heater screen rather than for headlights, it just happens to take the 12v from the sidelights. Basically trying to figure out if this relay were to fail in some way, would it put too higher current back to the fuse box. Indeed the joys... one minute working perfectly.. and the next.. not so well. The thing is I haven’t changed anything the only change I have noticed is that the relay doesn’t now appear to switch. Explains why that might be the reason my fuse is getting a bit warm is a different matter! Last edited by RobertGrieve on Sun Sep 16, 2018 4:39 pm, edited 2 times in total. The S1 did not use relays for the headlights as standard which is why we developed the headlamp relay upgrade. There is a relay for the horns though. Could be a change made by a previous owner. Suggest you consult the Factory wiring diagram (there are several available for download in the Forum Knowledge Base) and try and get things back to stock. I suppose no harm in changing it anyway seen as i know it used to click and now does not. I have been observing the fuse when switching and although it is not blowing I’m pretty sure it will do. What confuses me - with the fuse out, one side of the fuse (the red circuit wires) has a resistance to earth of 1.5 ohms, not a lot I know but not a short circuit either. So can I assume that side of the circuit is healthy? The other side of the fuse (the 12v feed from the headlight switch), provides 12v on demand and also does not short to earth. Odd behaviour if you ask me but electrics are not my favourite! Measuring the bulb side of the fuse to ground with an ohm meter won't really help much as you are measuring the resistance of the bulbs to ground...in this case the side and rear lights ...red wires...and the instrument lights too if switched on. The resistance of filament bulbs is very low when off (cold) and will appear as almost a short circuit. An example would be a brake light bulb. Cold the resistance of one I measured was 0.54 ohms. So using ohms law (I=V/R) the instantaneous current flow at 12 volts would be 12/0.54 = 22.2 amps. However I know the manufacturer specifies it as a 21 watt bulb. So as the bulb very rapidly heats the current falls such that a few milliseconds later, again using ohms law, Power=I x V so I = P/V = 21/12= 1.75 amps. So finally the hot resistance R must be 12/1.75 or about 6.8 ohms.....roughly twelve times the measured cold resistance. The same is true of any filament lamp. So to measure the cables from the fuse you need to remove all the bulbs that cable feeds and then check the resistance to ground. It should then be huge...many tens of thousands of ohms. If it remains at an ohm or so either you have missed a bulb or the wire is shorted to ground. Also means the instantaneous current flow when turning on any filament lamp is many times the steady current once on. 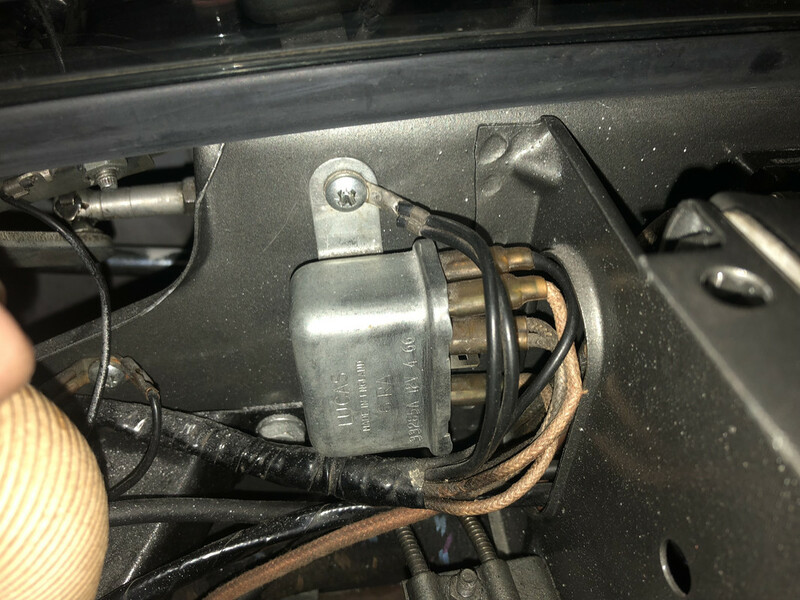 The resistance of a headlight bulb would be even lower and so the surge current at switch on will be large....with feed cable resistance probably about 30 amps but it is for a fraction of a second till the filaments heat. If you watch the fuse at switch on it may twitch but it should withstand the surge. If it pops five gets you ten it is a short circuit somewhere or the fuse rating is too low. About 17 continuous rating should be sufficient for head lights and 10 amps for the side sand rear is fine. Thanks Julian for your detailed advice! I had no idea a bulb would give such low readings so i understand what you are saying. I haven't read the whole thread, but were it me I'd be looking for a short to earth on something connected to fuse 5. It's not the relay blowing the fuse, unless it has a short to earth in it. Have now isolated to the external bulbs and will check the 10 pin connector for any issues. No issues with the relay, works nicely now and dims the rear screen light as it should.